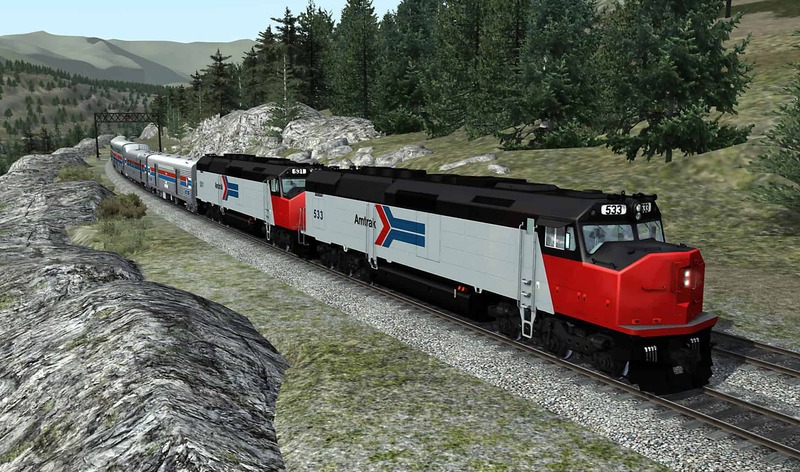 The husky Electro-Motive SDP40F was Amtrak’s first new diesel – and it’s soon coming to Train Simulator! 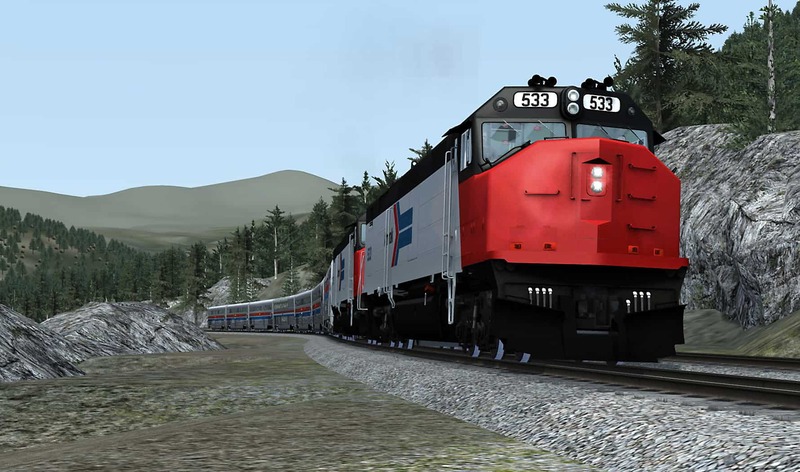 Amtrak’s Electro-Motive SDP40F – a memorable, historic, but star-crossed diesel locomotive – is coming soon to Train Simulator through the craftsmanship of DTM! 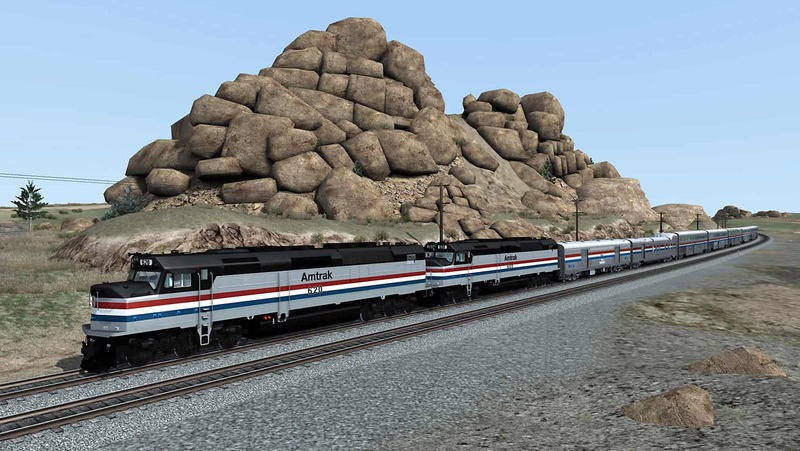 On May 1, 1971, the National Railroad Passenger Corporation – commonly known as Amtrak – took over most passenger-train operations in the United States. The 1960s had been unkind to rail passenger carriers in the U. S., and in assuming the role from the private railroads, Amtrak had no choice but to gather the best available locomotives and passenger equipment that remained among those railroads’ rosters. In diesel locomotive terms, that translated primarily to Amtrak acquiring a sizeable roster of second-hand Electro-Motive E8 and E9 diesels, the youngest of which were a decade old. The veteran E-units could only be considered a stop-gap solution, and Amtrak contracted with Electro-Motive for a new model – to be designated SDP40F – that was envisioned to serve as standard power for Amtrak’s trains outside the electrified Northeast Corridor. 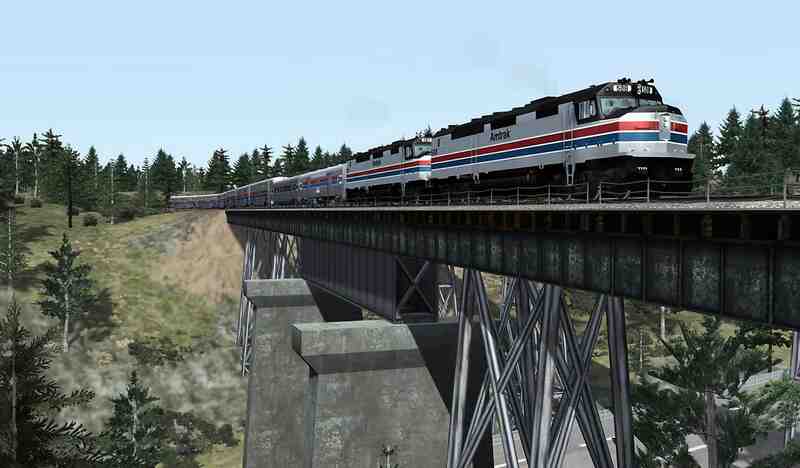 Amtrak soon ordered 150 SDP40Fs. The SDP40F would utilize many of the same components and design elements as EMD’s extraordinarily successful freight-service SD40-2. 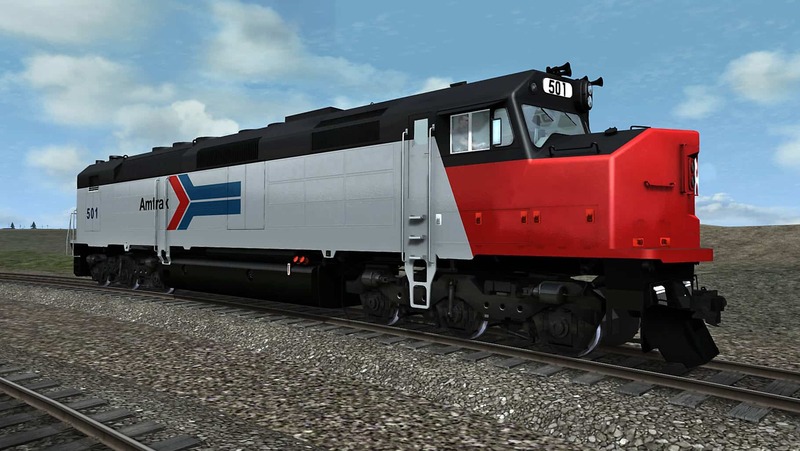 Like the SD40-2, the SDP40F would be rated at 3,000 horsepower (derived from an EMD 645-series, turbocharged, two-cycle V-16 power plant) and would ride a six-axle, C-C wheel arrangement (although for weight reasons, the SDP40F would use a modified “hollow bolster” truck design as compared to that of the freight diesel). There were other differences, the most visual of which was the SDP40Fs streamlined “cowl” carbody styling. Indeed, outwardly, the new SDP40F bore a strong resemblance to the EMD FP45s and F45s that had been constructed between 1967 and 1971 for Santa Fe, Great Northern, and Burlington Northern. To provide steam-heat, the SDP40F was equipped with a pair of steam generators and a 1,350-gallon internal water tank. All told, the SDP40F was a heavyweight, tipping the scales at just under 400,000 pounds. Amtrak’s 150 SDP40Fs (Amtrak 500-649) rolled out of EMD’s LaGrange (Illinois) plant between June 1973 and August 1974, and took the point of passenger trains across the U. S. The big diesels, delivered in Amtrak’s Phase I red-nosed livery, were impressive to see and hear and brought reliability to the power pool – but trouble awaited. Over the next several years, the SDP40F was involved in several derailments at speed on railroads including the Chessie System, Louisville & Nashville, and Burlington Northern. Typically, the derailments occurred on curves of 2 degrees or greater and involved a trailing SDP40F and/or the first baggage car of the train lifting off the rails. The exact cause remained elusive, with theories ranging from excessive yawing on sometimes less than pristine trackage, to sloshing of the enormous water weight in the internal tank of the unit, to a hidden design defect in the hollow-bolster truck. With the cause uncertain, some of the host railroads began to temporarily ban the SDP40F, and the Federal Railway Administration (FRA) imposed a national 40-mph speed restriction on the units when operating through 2-degree or greater curves. The results were chaos for Amtrak, as long-distance trains ran hours late due to the imposed speed restrictions. It was all too much for Amtrak. The derailment problems with the SDP40Fs, combined with the fact that the units would in any case soon need to be converted from steam heat to electrical head-end power (HEP) as Amtrak’s new generation of rolling stock arrived, resulted in the decision to phase out and replace the young SDP40F fleet. Ready to take their place was a nimble diesel – the four-axle EMD F40PH – that would eventually prove every bit as successful as the SDP40F was beleaguered. Although the F40PH had originally been envisioned as the little “short haul” sister to the big SDP40F, it would, in fact, became Amtrak’s standard-bearer. Beginning in 1977, SDP40Fs – barely four years old – began heading back to EMD, where components – including 645-series power plants, alternators, and traction motors – would be stripped out and used in “new” F40PHs. By 1981, less than a decade after the first units had been delivered, the era of the SDP40F in passenger service was over, although a few remained in Amtrak work train service into the mid-1980s. 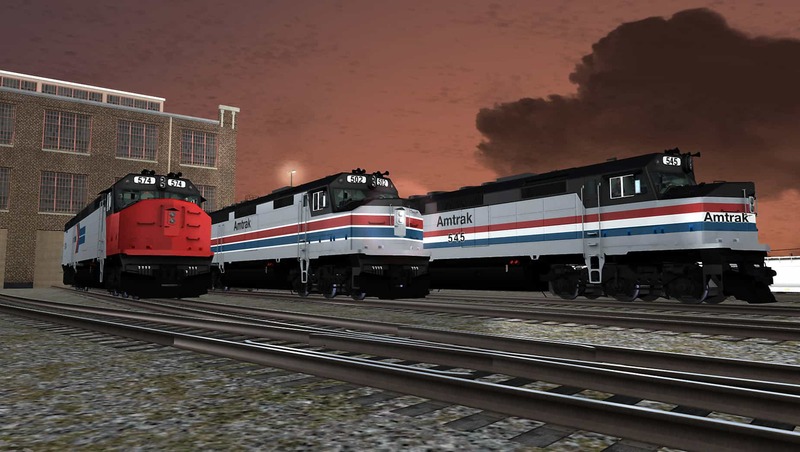 While the vast majority of the Amtrak SDP40Fs were returned to EMD for “remanufacturing” into F40PHs (EMD did retain a pair as test-bed units), Amtrak swapped 18 of the diesels to the Santa Fe in trade for veteran Santa Fe road-switchers and switchers. Overhauled and rebuilt for freight service (including removing the steam generators and replacing the hollow bolster trucks), the ex-Amtrak SDP40Fs were reclassified by Santa Fe as SDF40-2s and given AT&SF road numbers 5250-5267. Saved from the scrapper’s torch, the last of these lucky diesels would carry on, providing service to Santa Fe and its successor, BNSF, until retired in 2002. 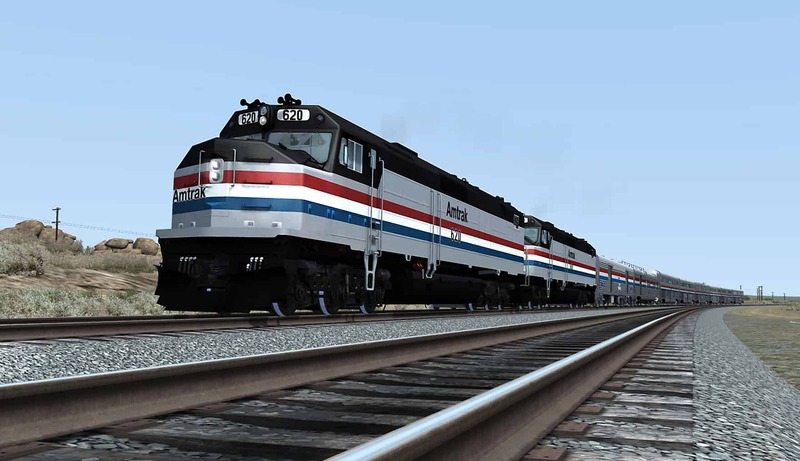 The memorable yet star-crossed Electro-Motive Amtrak SDP40F is coming soon to Train Simulator through the superb craftsmanship of DTM, and will be provided in Amtrak Phase I, Phase II, and Phase III locomotive liveries! Screenshots by Gary Dolzall. Amtrak’s burly SDP40F utilized many of the components of Electro-Motive’s successful SD40-2, including EMD’s 3,000-horsepower 645-series turbocharged, two-cycle V-16 power plant. The big six-axle passenger diesel was wrapped in EMD’s “cowl” carbody and, with steam generator and water equipment, weighed in at nearly 400,000 pounds. Note: Screenshots may depict content in development. 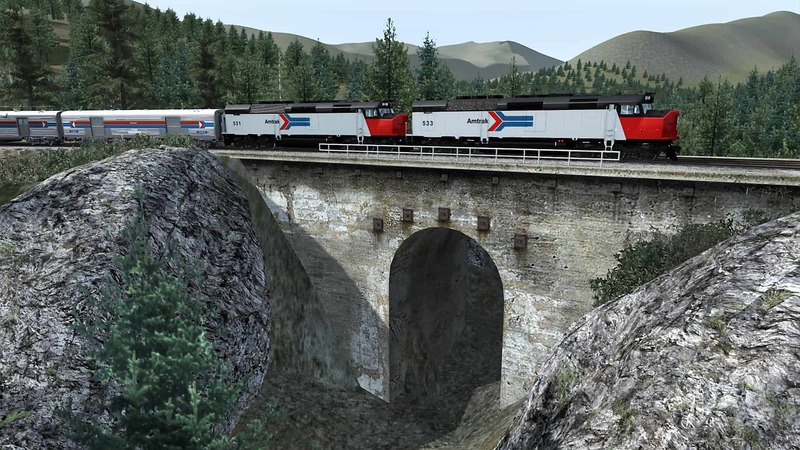 Wearing their original and distinctive, red-nosed “Phase I” liveries, a pair of Amtrak SDP40Fs are challenging Southern Pacific’s famed Donner Pass (above and below). Amtrak acquired 150 of the SDP40Fs in 1973-74 with the intent that the husky EMD’s would be the passenger carrier’s nationwide diesel motive power. Dressed in Amtrak’s Phase II livery introduced in late 1974, Amtrak SDP40Fs 508 and 581 make an impressive site climbing the west slope of Donner Pass (above and below). Alas, derailment problems and other issues lead Amtrak to replace the still-youthful SDP40Fs with EMD’s more versatile and nimble F40PHs beginning in 1977. Although earmarked for trade-in on F40PHs, a number of SDP40Fs were nonetheless decked out in Amtrak’s Phase III scheme (introduced in 1976) before the big EMDs were retired in the early 1980s. On Union Pacific’s Laramie Subdivision, a pair of SDP40Fs in Phase III livery are climbing Sherman Hill (above and below). 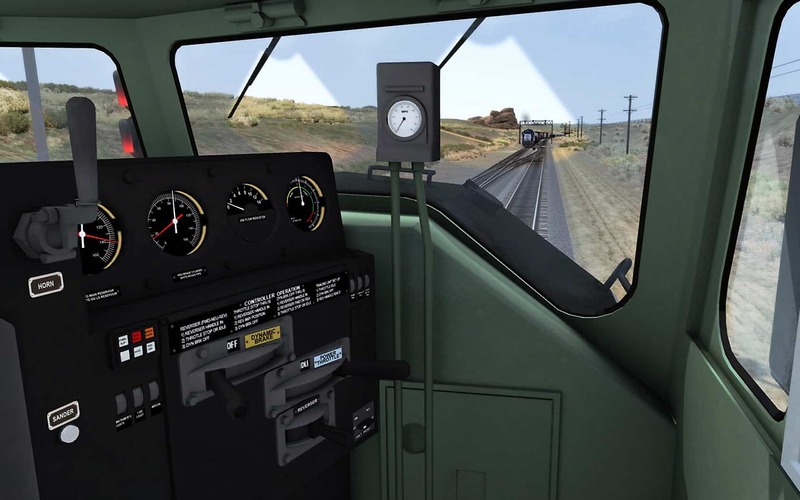 As engineer of the Amtrak SDP40F, you’ll climb aboard EMD’s distinctive “cowl” carbody cab and operate from a traditional “AAR”-style control stand. 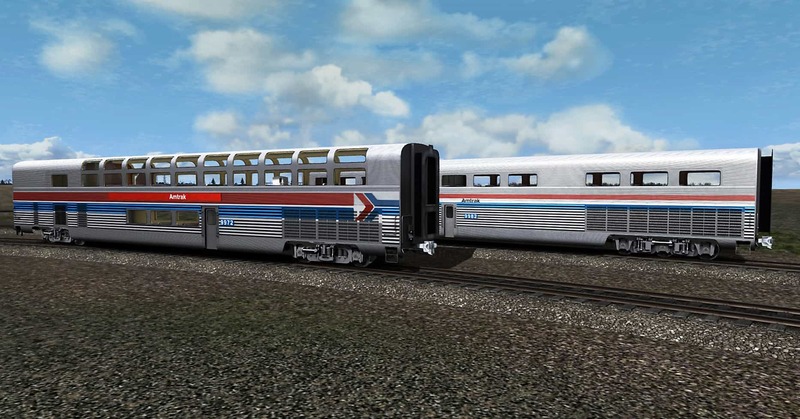 Accompanying the upcoming SDP40F will be a complete set of Amtrak’s ex-Santa Fe Hi-Level equipment including unique baggage-dorm transition car and Hi-level coach (above) as well as Hi-Level Lounge and Diner (below). 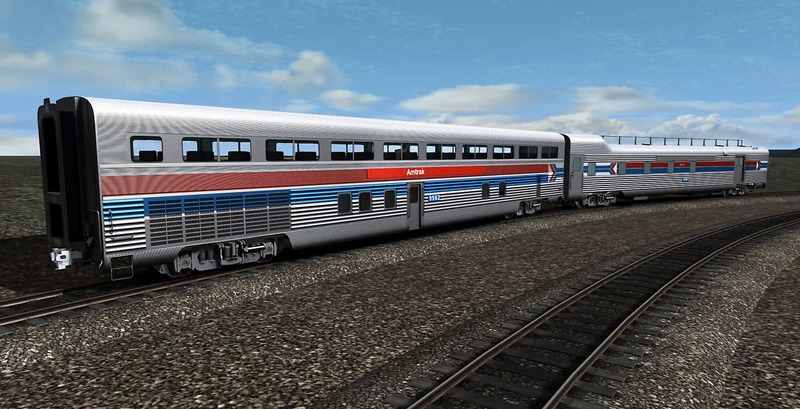 Also included will be a standard Santa Fe-style baggage/express car, and all cars will be provided in Amtrak Phase I and Phase III passenger car liveries! 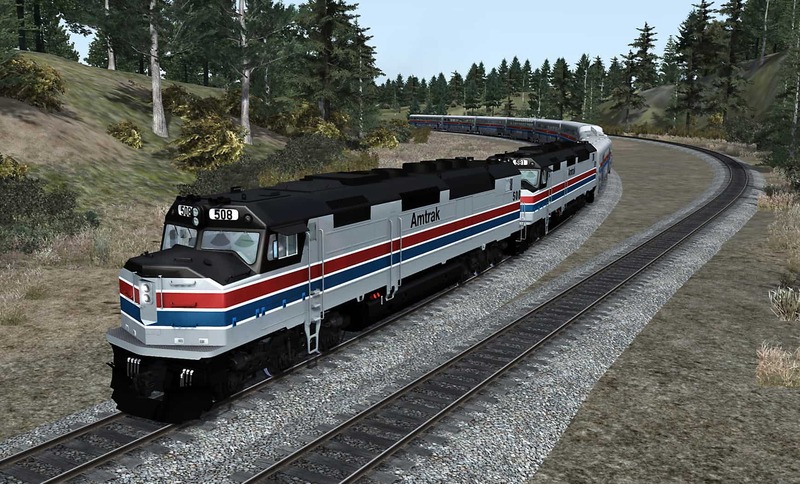 Memorable, historic – and yet star-crossed – the Amtrak Electro-Motive SDP40F is coming soon to Train Simulator in three authentic liveries of the 1970s and early 1980s!